The kitten now has an official name: he's Mahasamatman, after the character in Lord of Light . He will be referred to as "Sam." "His followers called him Mahasamatman, and said he was a god. He preferred to drop the maha- and the -atman, however, and called himself Sam. He never claimed to be a god. 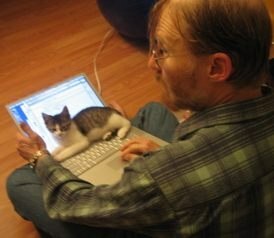 But then, he never claimed not to be..."
Sam helps me with my writing by keeping the keyboard warm! I can has cheezburger?. It's great!